LP erhältlich in schwarzem, weißen, roten und gelbem Vinyl. Die farbigen Vinyl-Scheiben (weiß, rot und gelb) sind auf jeweils 100 Stück limitiert. The LP is available as black, white, red and yellow vinyl record. The coloured records (white, yellow and red) are limiTED to 100 copies each color. Rockin' Hellfire wurde im Oktober 2011 in Salamanca (Spanien) von Mariano Iglesias , David Garcia und Zlatko Tudja gegründet. Mariano (Drums), Musiker seit Jugendzeiten, spielte in mehreren lokalen Bands in Salamanca, darunter den "Brasstones" wo er auf David (Bass) traf, und mit diesen dann später nach Jahren Zlatko überredete ein bisschen Musik zu machen. Zlatko (Vocals, Rhythm-Guitar), schon mit Musikhintergrund aus Deutschland, war Bestandteil der Originalbesetzung von Black Raven 1992 bis 2002. Seine eigenen Kompositionen wurden auf mehreren Tonträgern veröffentlicht. Durch seinen Umzug nach Spanien, verließ er die Musikscene für Jahre. Rockin' Hellfire hatte am Anfang Schwierigkeiten einen Sologitarristen zu finden, und nach einigen Wechseln im Line-Up kam Luis Prieto (Leadguitar) zu den Jungs. Leider musste David 2013 aus Berufsgründen nach Tschechien ziehen und verließ die Band. Für Ihn sprang Daniel del Amo (Bass) eigentlich nur vorrübergehend ein, er ist ein gemeinsamer Freund und bekannter Musiker in der Scene von Salamanca, bekannt von „How Are Blues“. Aber Danny gefiel es bei Rockin‘ Hellfire so gut das er festes Mitglied geworden ist. Das aktuelle Line-Up ist dann nun wie folgt: Zlatko Tudja (Vocals , Rhythm-Guitar), Luis Prieto (Leadguitar), Daniel del Amo (Bass, Backing Vocals), Mariano Iglesias (Drums, Backing Vocals). Sie sind sehr erfolgreich in Spanien, haben internationale Auftritte und konnten als Backing-Band Stars wie Cliff Edmonds und „Rockabilly Rebel“ Graham Fenton (bekannt von der Band Matchbox) begleiten. Das erste Album "Follow Us To The Fiery Depths Of Hell" beherbergt mehrere eigene Kompositionen der Band. 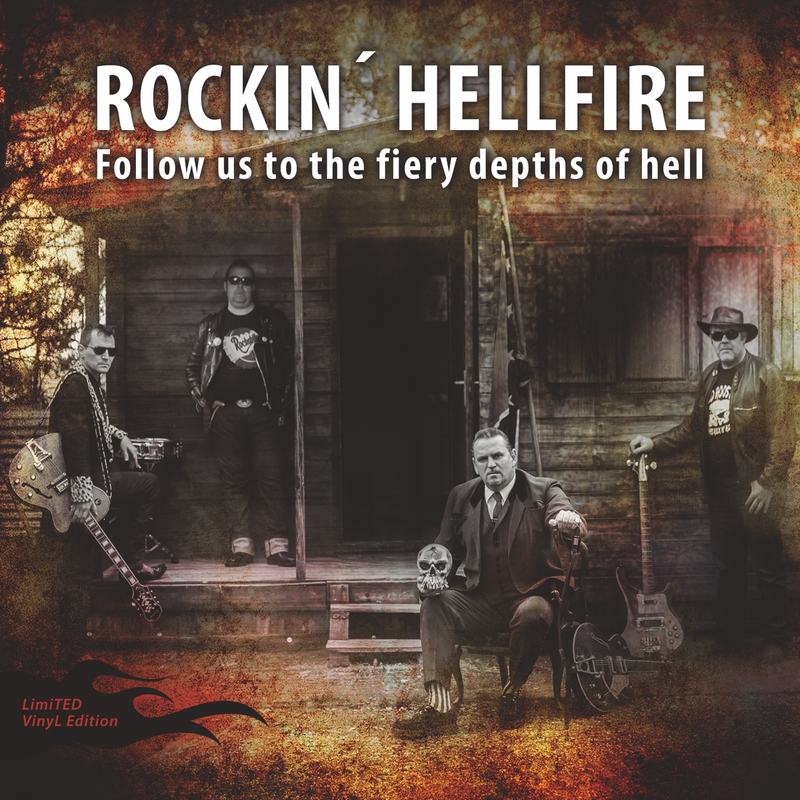 „If you listen to Rockin' Hellfire, probably you lose your soul!" Rockin' Hellfire was founded 2011 in Salamanca (Spain) by Mariano Iglesias, David Garcia and Zlatko Tudja. Mariano (drums) was musician since his early youth playing in various local bands, also in the "Brasstones" where he knew David (bass) and after years they met Zlatko (vocals, rhythm guitar) and asked him for makin' some “noise”, this was the birth of Rockin' Hellfire. Zlatko had a lot of experience in bands in Germany. He was member of the original Black Raven Line-Up from 1992 to 2002. He wrote a lot of Black Raven songs that where released on their records and CDs. He moved to Spain and leave the stage for a lot of years. At the beginning, Rockin' Hellfire had a problem to find a lead-guitarist, and after some changes Luis Prieto joined the band in 2012. Then David had to leave in 2013 for his work in the Czech Republic, so a friend and very known musician in Salamanca get into the band, his name: Daniel del Amo, famous from the Salamanca music scene and their band “How Are Blues”. So the actual line up is: Zlatko Tudja (vocals, rhythm guitar), Luis Prieto (lead-guitar), Daniel del Amo (bass, backing vocals), Mariano Iglesias (drums, backing vocals). The music? We could describe their style like a very moving British Rock n Roll / Rockabilly 70ties style, very bassy, with delay-guitars. 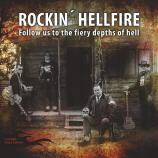 They are givin’ their music an own wild touch and call it: Hellfire Rock ´n´ Roll. The band is very successful all over Spain and now as well international. They backed rockin' stars like Cliff Edmonds and “Rockabilly Rebel” Graham Fenton, famous from the Matchbox. Their first album: "Follow us to the fiery Depths of Hell "contains various own composition. "So if you listen to Rockin' Hellfire probably you lose your soul!"